Marital Status: Divorced, widowed and single. Story: Broom Hilda is the 1500 years old witch who is constantly in search of a man. She used to be a beer drinking, cigar chomping and grumpy, but now she is just grumpy on occasion. Despite being 1500 years maturity is not among her most prominent traits. Those would be prankish, fun-loving and in desperate need of a man. Skills & abilities: Broom-Hilda is not a skilled witch but knows the basics like flying on a broom and zapping people. Background notes: Even though Broom-Hilda is a witch, there is remarkably little magic going on in the series. The enchanted forest however is a magical surreal experience. Over the years the weirdness of the setting has been reduced, but it is still there. Like the settings, the humor in the series has changed over the years. The politically incorrect bad habits like drinking swearing and smoking has been removed (for the most part) and a kid have been introduced. The magic between the characters is still there, but the humor is leans more towards children now. 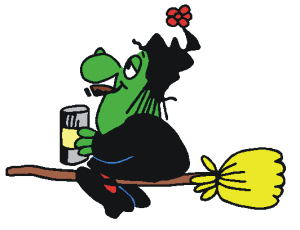 Like the rest of the original cast, Broom-Hilda has only appeared in one cartoon, Archie's TV Funnies from 1971 (voice by Jane Webb), but she has been able to get transferred to other medias. Most notable is a musical by Martin Charnin, who also turned Little Orphan Annie into a musical in 1977. The musical should have premiered in 2006, but is still in preparation. The only other media is merchandise like most other popular characters i.e. T-shirts, coffee mugs etc.